Mens soft and supple genuine black leather gloves in size Large - with the chilly days never far away, hands will always be grateful for this gift. Mens soft and supple genuine black leather gloves in size Large - with the chilly days never far away, hands will always be grateful for this gift. Snug Fit and less clumsy than heavily padded ski style gloves, these quality mens soft black leather gloves are great for driving, shopping or walking too - retaining the ability to hold and grip items efficiently and keep hands warm still. 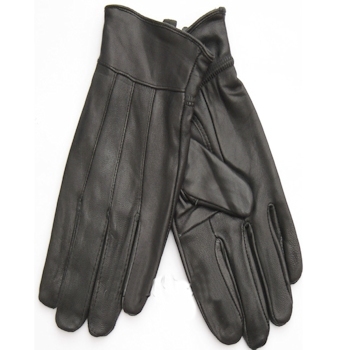 Hygenic and easy care 100% polyester lining with soft and supple genuine black leather outer to the gloves.